Back in the day, when tube transmitters ruled the broadcast world, common practice was to have a big cooling fan moving outside air through the transmitter building connected to a thermostat. Temperature swings of 30 to 40 degrees were common, however, the tube rigs could handle almost any temperature that didn’t melt plastic or freeze water. Today’s solid state transmitters are not that rugged. They like to have there rooms around 70 degrees +/- 10 degrees or so. Not to mention the other computer controlled equipment commonly found at a transmitter site. Things like air chain processors, STLs, remote controls, etc. So, lots of air conditioning is the norm, and with lots of air conditioning comes lots of maintenance. Of course, the entire cooling coil inside is frozen solid. 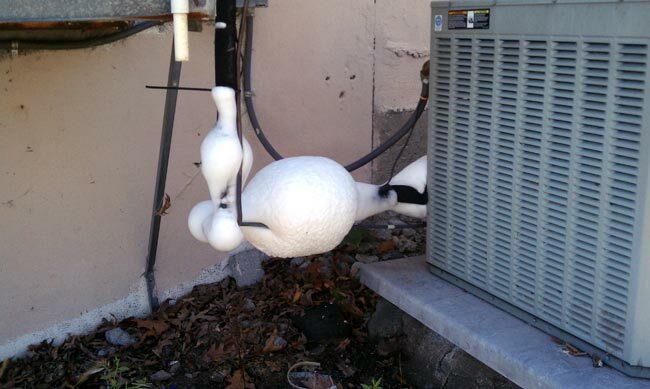 This condenser is low on refrigerant, causing icing problems. It has a slow leak somewhere and is about to be replaced. Other reasons for this happening are malfunctioning or non-existent low ambient kit on the condenser fan. Sometimes less than knowledgeable persons will install a 5 ton unit designed to run throughout the year but not take into account the effect of moving below freezing air at high speed across the coils. Insufficient air moving across the cooling coil will also cause this. 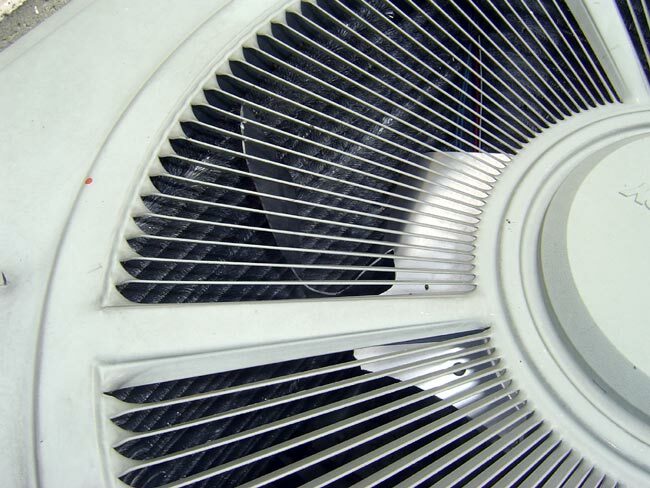 Insufficient air flow can be due to plugged air filters or clogged fan/blower blades. The fan blade is sheared off and jammed into the condenser coil. This happened during power transfer from generator power to commercial power. Naturally, it was at 1 am in the morning after a pole mounted transformer had been replaced. When the building transfered back to commercial power, I went outside to use the “bathroom” before my two hour drive back home. I though I smelled something hot, you know that cooked paint/plastic smell, but couldn’t really track it down… the winds were kicking up and another thunderstorm was on the way. The next afternoon, however, when the sun was up and the site was working on one air conditioner, the temperature alarm went off. Upon arrival, I found the condenser breaker tripped, resetting it caused the building lights to dim. The fan motor was shorted to case. I would theorize the aluminum fan blade suffered from metal fatigue, likely because the blades were not balanced causing a vibration. When the power transfer occurred, there was just the right combination of torque and centripetal force to cause the blade to rip, then lodge in the condenser coil. The fan motor has replaced, but I think it is time to replace the whole condenser unit, which will be expensive. 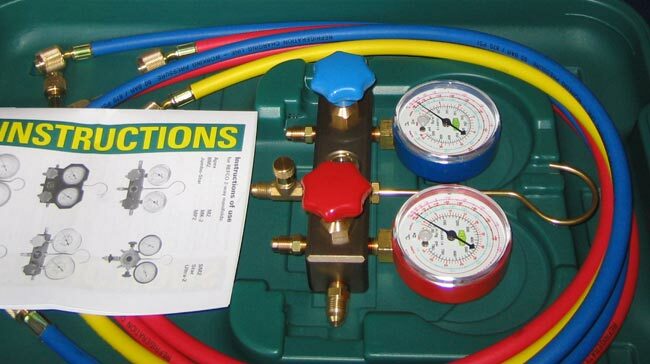 I found having a set of gauges to check the head pressure and suction is a good diagnostic tool to quickly pinpoint problems with HVAC units. This way, when the HVAC tech shows up, you can quickly point him in the right direction.